JLSA’s Membership Development Council (MDC) is responsible for coordinating the activities that train, orient, accept and enhance the development of all Members. MDC plays an important role in improving the satisfaction and retention of all Members, which is vital to the success of the League. Created and instituted a new Sponsor Training program for Active members wanting to serve as Sponsors, training 16 Sponsors. Received applications from 134 Prospective Members, with 129 having accepted the invitation to join the 2016-2017 New Member Class. Kicked off the year in July with a screening of the documentary “Miss Representation,” which was attended by 93 Members. 124 Members attended a JLSA-exclusive “Suffragette” screening at Santikos Bijou on November 30th. 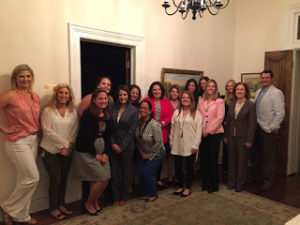 37 Members learned how to make the most of their JLSA years of service at a JLSA Career Track Training, featuring 4 Sustainers – Jeanie Travis, Anne Ballantyne, Daniela de Serna, and Gayle Girdley – sharing their experiences with our New Members and Actives. 21 Members received CPR Certification at a special training on March 7th. Total of 177 attendees at 6 Taboo series trainings. Civic Training Manager set up a special City and County Leaders’ Roundtable event, featuring Bexar County Commissioner Tommy Calvert; Bexar County Commissioner Kevin Wolff; City of San Antonio Councilman Mike Gallagher; City of San Antonio Councilman Ron Nirenberg; and City of San Antonio Councilwoman Rebecca Viagran. Members earned 346 Mission Credits through Training & Education events this year. The 2nd Annual LeaderBOARD kicked off in December, with 21 participants learning from JLSA Sustainers, Actives, and industry experts about the operation and function of nonprofit boards so they can be effective and informed board members for local nonprofits. Participants from this year and last year were invited to participate in a Board Day to meet nonprofits looking to fill spots on their boards of directors. AMIGOS has served 51 Members so far this year, including welcoming 24 new JLSA babies! 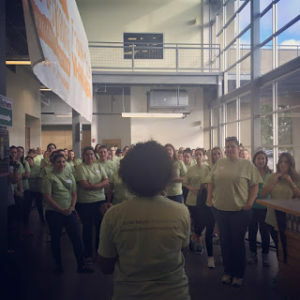 New Member Project at San Antonio Food Bank – 80 New Members packed 36,000 pounds of food into 1,180 boxes, representing 28,125 meals, in just 2 ½ hours on September 19th. New Members earned 265 Community Awareness Training credits, learning about our city and the services available in the San Antonio community. New Member class for their project at the Food Bank. Our 397 Actives have earned 910 Mission Credits as of April 26th, which translates to 2,730 hours spent volunteering at our fundraisers, taking advantage of training opportunities, or supporting our community programs. As of our April GMM, we have had 1826 attendees total at our General Membership Meetings. We had a record 12 Sustainers and 31 Actives Transfer into JLSA, accounting for 255 SA Works hours completed, 31 Community Awareness credits, and 53 Mission Credits. Volunteer Extraordinaire: 197 attendees celebrated our 2016 Volunteer Extraordinaire Rhonda Kolm Calvert at the San Antonio Country Club on March 26th, nearly doubling the budgeted goal for income for the event. 180 Sustainers RSVP’ed for our Sustainer Luncheon in October, where they were celebrated and thanked for their years of service to JLSA and the years spent serving the San Antonio community since going Sustainer. Each Sustainer was gifted a complimentary 3-day pass to Holiday Ole Market. On December 3rd, 54 Sustainers attended our Holiday River Barge Cruise on the San Antonio River, featuring a special happy hour at the Sternewirth bar at Hotel Emma. 16 Sustainers took an exclusive tour of the Tobin Center at our Sustainer Socials, including one mixer with our New Members. By Megan Bluntzer, Membership Writer, and Joy McGaugh, VP of Membership Development Council.